ROCKINGHAM – Rockingham regular Tommy Plott used a perfect .000 reaction time and .008 package to draw first blood Wednesday in the SFG Super Bowl of Drag Racing which culminates with $100,000 to win races on Friday, Saturday and Sunday. Plott, a former Hoosier Tires Carolina Coalition champion, waded through a first day field of 251 to reach the final where he beat T.G. Paschal of McLeansville to claim the initial $10,000 winner’s share of the purse. Thursday’s race pays $20,000 to win. 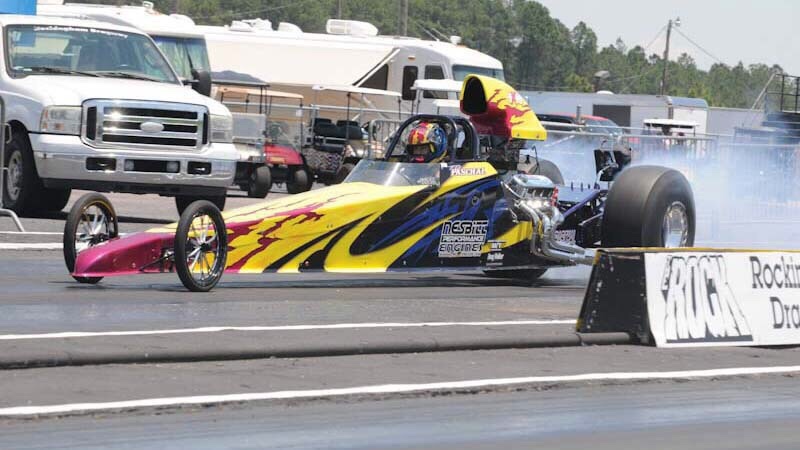 WEDNESDAY Final – Tommy Plott, Winston-Salem, .000, 5.198 on a 5.190, 130.76 mph, def. T.G. Paschal, McLeansville, .023, 4.686 on a 4.660, 147.49 mph. Visit DragChamp daily for the latest big money bracket racing news and results.